Is this the "best" passage I could have shared? Perhaps not. But this section summed up so many of my own conflicted feelings about cooking for my family and friends: I love cooking...but...god, I'm so not the caterer, dudes. I am not the Alice to your Brady Bunch. And the best food writing, in my mind, is that which reflects back to us our own experiences, our own passions, our own humanity. Which BLOOD, BONES, AND BUTTER accomplishes. In spades. 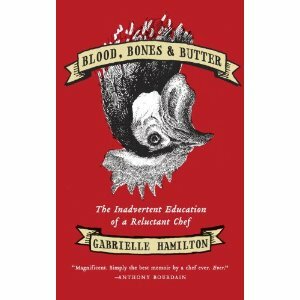 I most certainly wasn't doing coke lines and living on my own at 16 years old...but somehow, some way, Gabrielle Hamilton's experiences still end up being my own. And don't even get me started on her passage about women in restaurants: I'm not a chef in a restaurant but Hamilton still manages to mirror my own feelings about being a woman in a professional environment. It's brilliant. To keep myself from going on and on, I just want to end by saying this: buy it. Mark it, pre-order it, schedule it on your Outlook. This is the second coming of M.F.K Fisher. And I do not say this lightly. Eat, drink, and jump on the Gabrielle Hamilton bandwagon. I just put it on my to-read list. Beth, I can't imagine you'll be disappointed - it's gorgeous. I heard about this one and can't wait for it to come out. Thanks for advance sneak peek!